The ALUTECH Group of companies has doubled its production capacity of aluminium extruded profiles. AluminTechno, the factory that manufactures the extruded profiles, has just completed the construction of a second extrusion plant. Four more new workshops were added to the current ones; a workshop for extrusion moulding, an anodizing plant, a powder-coating facility and a new area for packing of aluminium profiles. 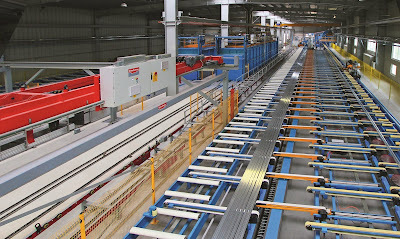 The total production capacity of the factory now totals 45-48 000 tones of the extruded profiles per annum. The new workshop for extrusion moulding includes two lines of 7 inch presses allowing a substantial expansion of the product range. Now AluminTechno consists of 6 extrusion lines: two 5 inch presses, three 7 inch presses and one 9 inch press. The launch of the second anodizing workshop increased the total capacity by 10 000 tones of anodized profiles per annum. The new line is fully automated and equipped with machines from one of the leading suppliers of anodizing equipment in the world. The new powder-coating line is twice as productive as the current one. Two independent chambers for powder-coating make it possible to powder-coat two batches of extruded profiles in different colours simultaneously. The automatic logistics system has contributed greatly to increase of the production capacity. It unites the extrusion moulding and powder-coating workshops, aging ovens, anodizing line and stillages used to hold stocks of product. 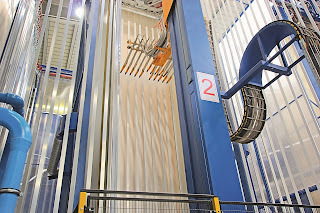 Two new packing lines for the finished goods were launched to process 40 tonnes of the profiles daily. The packing cycle of the lengths is only 22 seconds. Quality of the extruded profiles meets the highest requirements of standards DIN17615, EN 755-1, EN 755-2, EN 12020. The quality of powder-coating meets the standards required by the Swiss certificates Qualicoat/Seaside, and Qualanod.